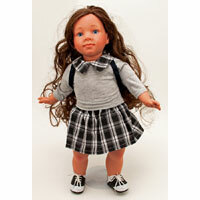 18 inch Annette Doll is fully assembled with light skin tone, brown hair and blue eyes. 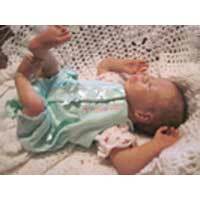 17 inch preemie Zoe has a light skin tone with closed eyes and is wearing a pink sleeper with a matching headband. 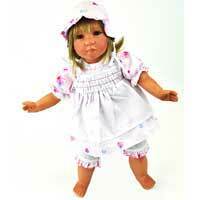 18 inch English Doll is fully assembled with a white and pink dress with matching leggings. 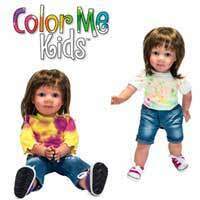 18 inch Color Me Kids Carly Doll with Fabric Paints has medium skin tone with brown hair and hazel eyes. 18 inch Color Me Kids Carly Doll Kit includes 3 fabric paint colors to design your own tshirt and a medium skin tone Carly Doll with brown hair and hazel eyes. Each custom made reborn doll comes with a signed birth certificate, hospital wristband, a faux formula baby bottle, pacifier and wearing a disposable diaper and a new outfit. 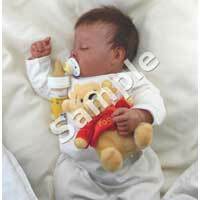 Girl and boy reborn dolls come with a birth certificate, instructions for care, a magnetic pacifier, Mohair conditioner and a faux formula sealed baby bottle.